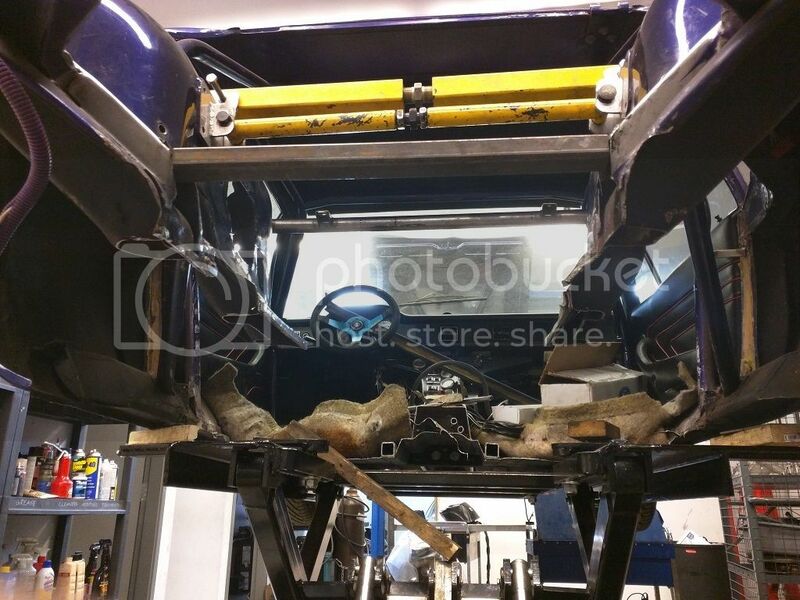 As some of you may know I started the process of fitting a Coyote into my Pantera several months ago. As these projects typically go the project has snowballed into something a bit more extensive. Peter Havlik lives close by and visits on occasion and reccommended that I start a post detailing what I have begun so here goes. 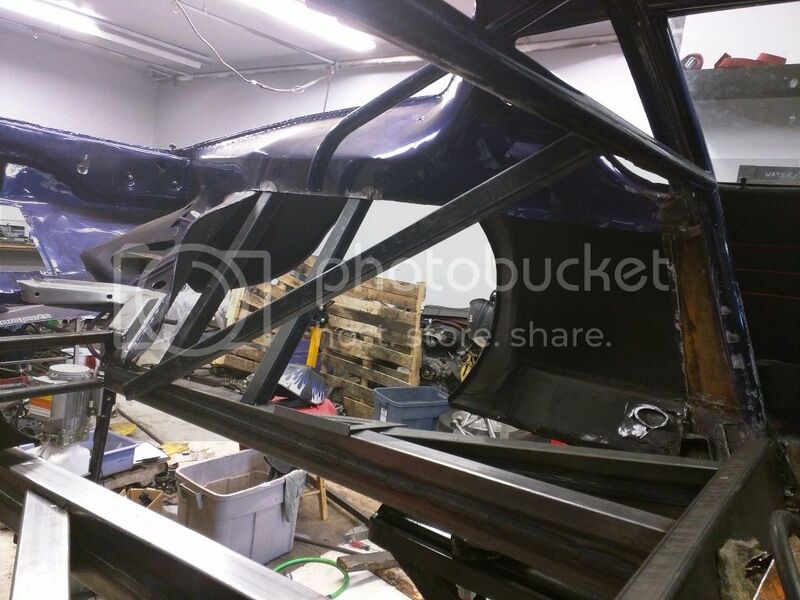 For those who are wondering why Coyote swap posts are in the chassis systems section that will soon become clear. In the process of fitting the motor in the position and configurationI wanted I came across many roadblocks. The first of these was the width of the frame rails. As with my last motor I will be running a dry sump system on the Coyote. 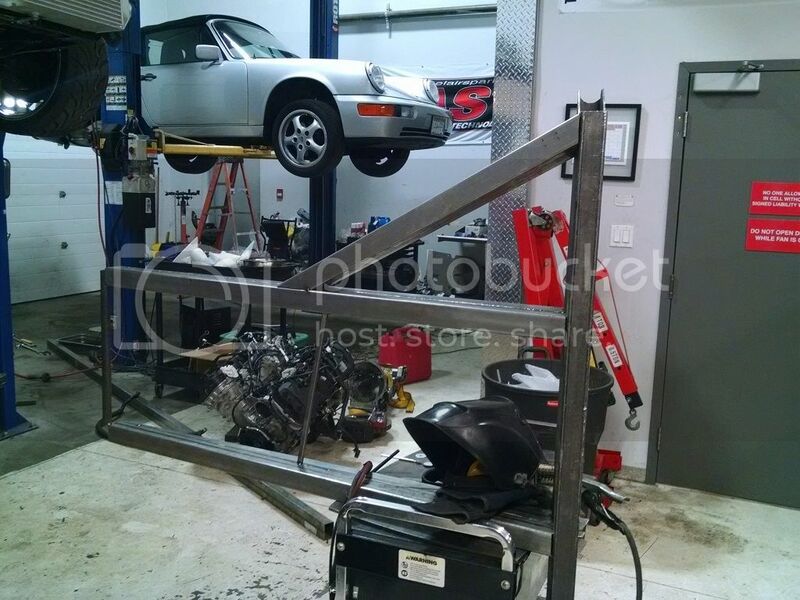 The width of the oil pan filled the frame rails and left insufficient room for fittings. The next roadblock was also due to frame rail width. I could not lower the motor enough as the bellhousing even when heavily trimmed woud not allow the engine to sit any lower in the car. The third roadblock was insufficient space between the balancer and the lower firewall for a dry sump mandrel. I had already cut out the upper firewall for clearance. While slowly tackling each of these issues I noticed that the passenger frame rail was bent. At this point I made a decision. I was going to widen the frame rails. This would give me more space for the motor. 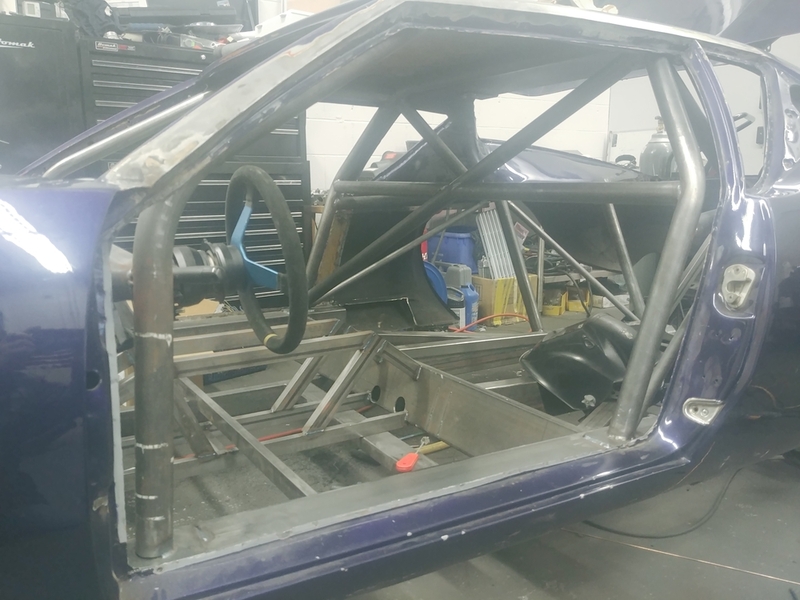 I then decided that I was going to also move the lower firewall crossmember forward several inches and rebuild the firewall incorporating my roll cage as the new firewall. The project had begun and out came the sawzall. Might want to sit down for this one. Keep in mind that I did brace and support all rear metal to prevent flex and bend while cutting. Really spacious in there now. 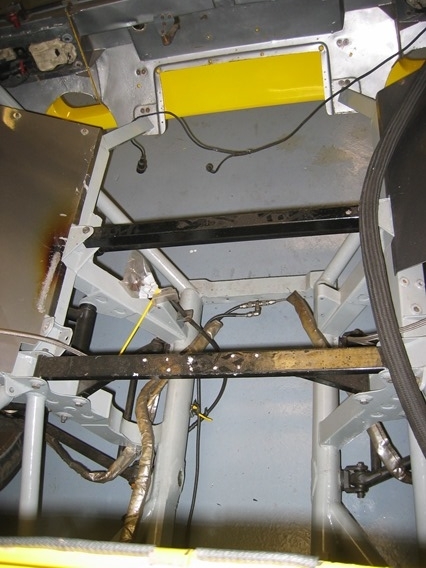 Years ago I had installed the Hall Pantera chassis stiffening kit part of which involves installing 2x4 box steel tubing inside the rocker panels. 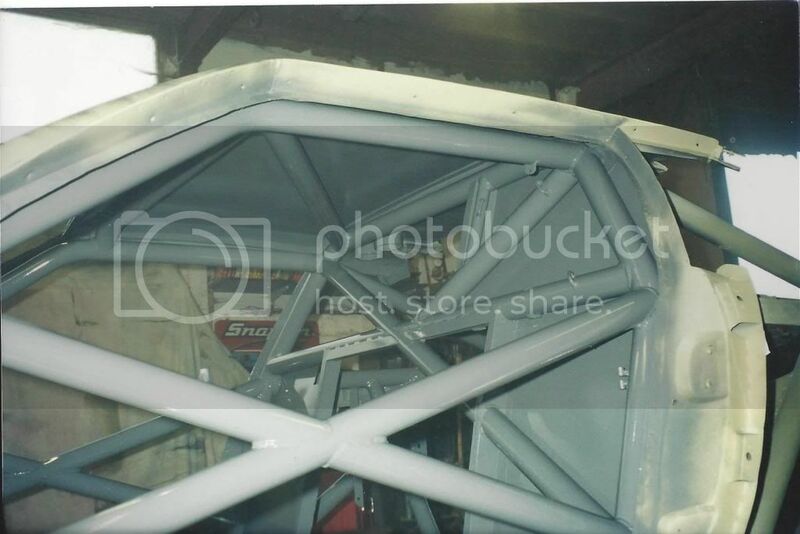 The roll cage main hoop is welded to this. It makes for the beginnings of a very stiff chassis. The main firewall crossmember is made from 2x6 box tubing with an 1/8" wall thickness. It is a bit more weight than I was hoping for but it was also all I could get in any sort of a decent time frame. I can always add some lightening holes later if I feel the need. It has a 6' height so I can Pick up the full height of the rear frame rails, have it low enough to have the option of flat bottoming the car, and still have enough meat left to engage the 2x4 tubes in the rocker panels. The frame rails are made from a combination of 2x2 and 2x3 box tubing in a .093 wall thickness. The 2x3 tube has been cut lengthwise at an angle and welded to the 2x2 tube to mimic the angle of the stock rails. This has the added benefit of an extra stiffening rail within the tube. 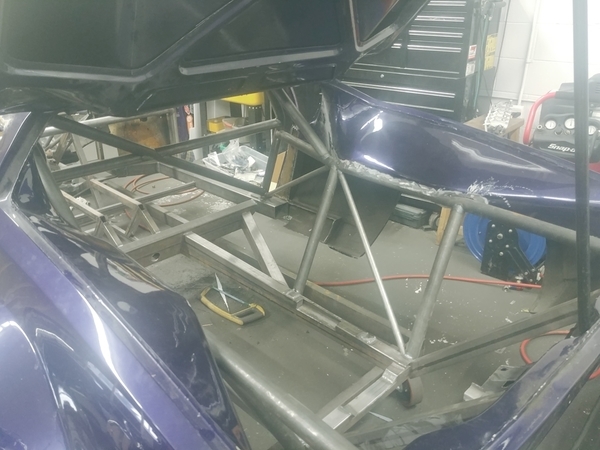 The frame rails have also been tabbed through the firewall crossmember on the vertical sides to add rigidity to the crossmsmber. The same treatment was applied to the frame rail diagonals and I was able to use the off cuts from the main rails repurposed for this. 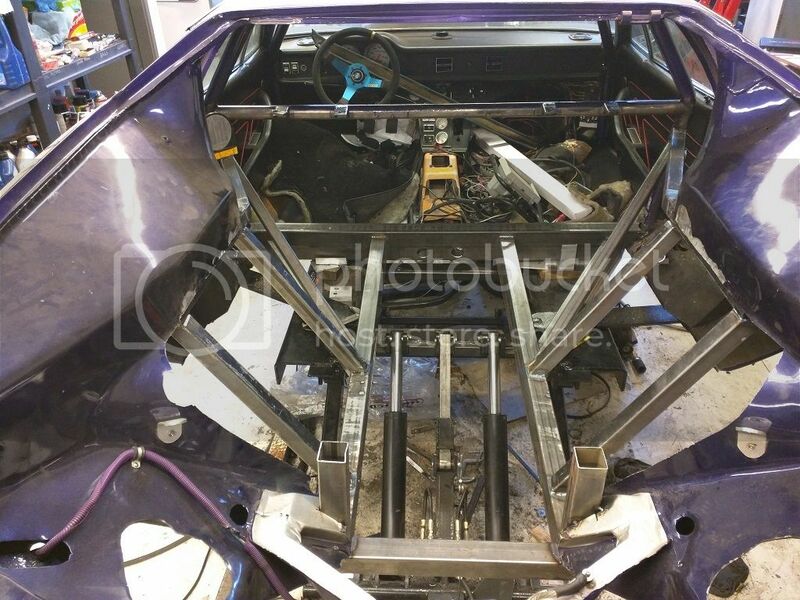 The frame rail layout is very similar to the stock setup and is very stiff once welded together. 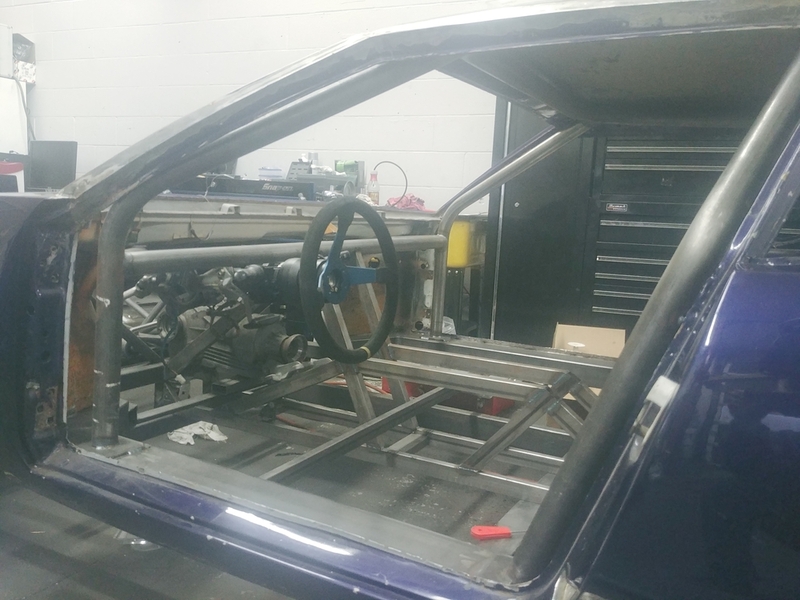 Once the main frame rail assembly was welded together (tig everything as I dont have a mig) I fit it into the car. This was the most critical step. This would ulimately determine how straight the car was. As we all know these cars are not exactly perfect dimensionally in the sheet metal department. I wanted at the very least for the frame to be spot on. I borrowed a laser level from a friend for this purpose. 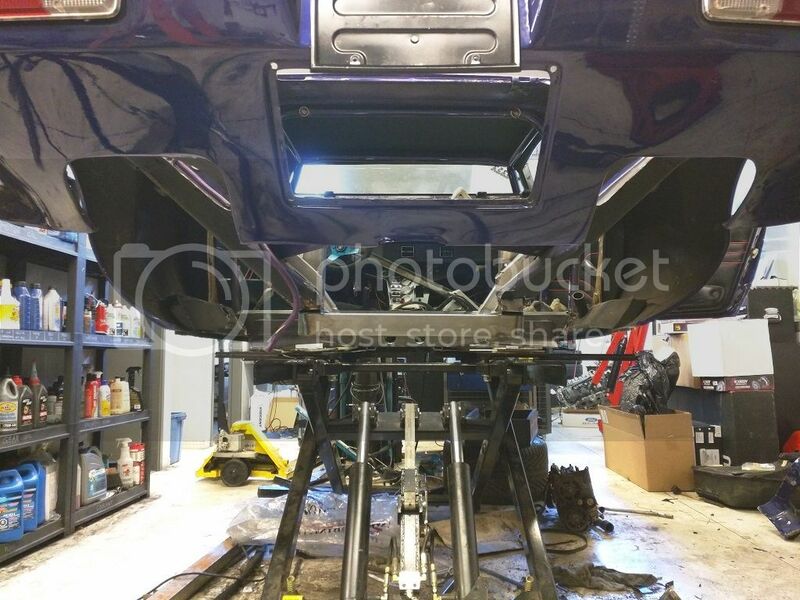 everything was aligned on level to within 1/8 of an inch from the front frame to the center to the rear and tacked into place. At this point I tacked some temporary bracing in place to hold the frame in position while I completed the rest of the work. With the transaxle further forward the next clearance issue was the axle passthrough in the stock inner fenders. Might as well chop all that out too. At this point it was clear that I would be building a hybrid space frame/unibody car. I continued to add frame bracing for suspension pickups and triangulation. There will be much more going on as I continue but this is where I am at the moment. I am still hoping to have the car back on the road by the middle to end of summer but I have a ways to go. Wow! Constantly impressed by the skills displayed on this board. Keep the pictures coming! Yes I suppose insanity could be considered a skill. Great work Blaine. Keep us posted. Looking forward to more posts and pics. Man, I wish I had the metal-working skills, vision, (and cojones) to undertake a project like this. The expression "whole hog or no pork" comes to mind. It's awesome. Blaine's fabrication (and insanity) skills are second to none. I know that, when this project is done, it will have been done correctly with much improved chassis rigidity and suspension geometry over the original. This will all be necessary to fit and use the Coyote, which Blaine will no doubt modify to ensure he has the highest useable rwhp of any Pantera in the world. I not only embrace insanity ( Creative Genius) but APPLAUD it as WELL!!! It's a good thing I was sitting down when I saw this or it would have floored me. Awesome job so far. 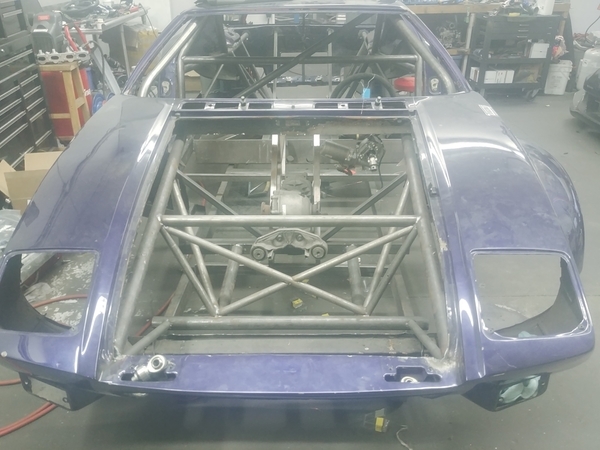 If you keep cutting out the sheet metal and add a few more struts you'll effectively end up with the rear chassis from the Pantera Si model from the 90's. So you might check out some pics of those cars to get some ideas. Fitting a dry sump between the frame rails even with a pushrod Ford engine can be challenging. But I imagine it's even more difficult for the Coyote engine. Looks like you've made a great start! Awesome Blaine - keep the pics coming! I will do some digging to see if I can find some info on the SI stuff. That could help get some ideas flowing. Here are some pics of an Si that I used to own which may help spur some ideas for your own project. As you can see, there are some similarities with your layout. Good luck with your project. Hope this helps. what is the chassisNr. from the Si witch you show on the photo's? Please post the VIN of your 90Si or PM me with it for the registry. I am sure any information or additional photos of your Si and your race car that you would care to post here would be of great interest to many of us. So as to not hijack this thread, I suggest starting a new topic under the "Specific Car Photo Forum" section. I believe this would be chassis #9628 the ADA Pantera now owned by Patrick Hals. Thanks for posting that pic Dave. 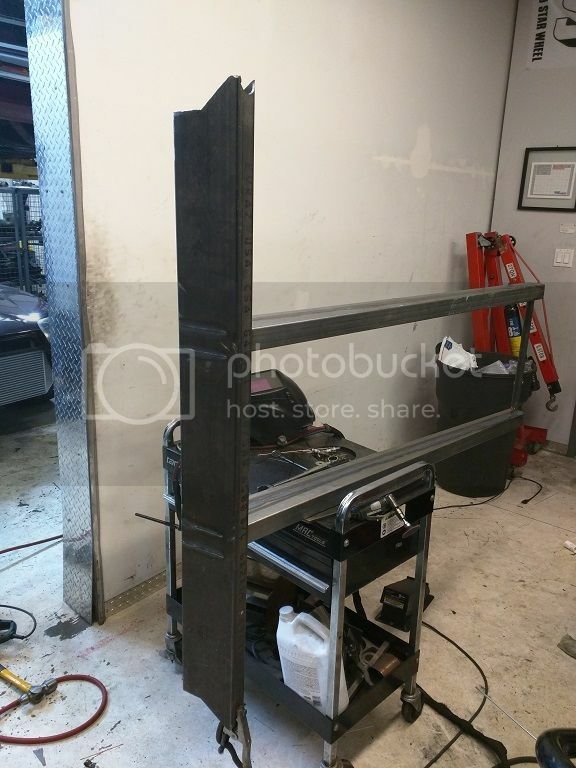 I was having some trouble finding a good photo of the frame without the sheet metal in the way. As noted by Joules, this is chassis 9628. I owned this with a "partner" in the UK and eventually sold it. Both transactions were what you'd euphemistically call "learning experiences", but that's a longer story! FYI, note that this "race" chassis actually added only a few extra bars for support at the rear (e.g. the down-bars from the main hoop). It also had some pieces cut away from the stock chassis to make the engine/gearbox fit. So that's a good testament to the fact that the layout was fundamentally sound to building a stiff platform. Your layout looks just as good. Glad this was helpful. I have many other pics of the chassis including those from the 1997 logbook, and as I recall there are more details about the Si chassis in various PI magazine back-issues. Look forward to seeing more pics of your project as you progress! Thanks for the clarification, Dave. I did not know who you were, but I have now figured it out. We have corresponded in the past, but it was not until your last post that I connected the dots. Do you still own #9813? There are very few other race prepared GT5 Panteras, and I have always wondered how you made out with yours. Did you campaign it? I am sure I would not be the only one who would love to see you start a thread on it and post some info & photos. Well I havent made much progress however Christmas did come early. I managed to get a killer deal on a Graziano 6 speed transaxle which will be the new addition to #6214. This thing is MASSIVE compared to the ZF. Even with the frame rails moved outboard by 4" I still had to notch the passenger side rail as the whole trans is offset to the right. I still have a VERY VERY long way to go but any progress is still progress I suppose. Wow, Blaaine awesome project. Are the ratios in line with what you need? or will modifications be necessary? I am building the Coyote to be a pretty high revver so the ratios should be about perfect. Should make for a nicely driveable street car with the upper ratios for good speed. They are geared a bit low but ultimately it will work in this configuration. What do you figure engine RPM at 80mph and what is the Coyote's redline? Nice work !... Love that color and the upgrades! At 80 MPH the engine will be turning 3200 RPM roughly. This is based on which trans I think I have. There were some gearing differences between them. This Coyote should be able to handle sustained 8500 RPM with brief forays a bit higher. These are all estimates for the time being. Drop gear sets are available to make the ratios a bit more pleasant for cruising but I will see how this works before I spend that kind of money. Besides, I like the sound the Coyote makes when it revs. Cool project! What are you planning to use for a shifter? Is your Graziano an ex-Gallardo unit? I am not sure which variant it is. The previous owner of the box does not have the history. I was hoping to find out by serial number but im not sure if Graziano will share that information if I can even get in touch with them. I am not sure what I will use for a shifter. I may see if I can get a hold of a gallardo unit or may just fabricate my own. I figured it was time for an update. I have been super busy at work and weekends have consisted of playing catch up on customers vehicles. I was finally able to break away and do a bit more work. Since I last posted many things have changed. Due to changes being made to the aero of the car I have lost the ability to run a dropped floor pan. This made sitting in the car with a helmet very tight with the current roll cage so I decided to rebuild the cage. I also decided to redo how the rear chassis was built and decided to go with round tubing over the square stuff I was using before. Seeing as the Gallardo transaxle has an output shaft to feed a front differential I decided to play a bit. I got a hold of a R8 front differential and decided to carry the framework right to the front of the car. To think this started off as a simple motor swap..... I now have enough welded together to get the car on a rotisserie to finish welding all of the joints. I can then get to the body modifications. Other than removed drip rails and moving the front fenders a bit higher I am keeping the upper portion of the body pretty much the same. The lower portion of the body will be getting a host of functional aerodynamic elements to assist in track duty which I am hoping to see plenty of. 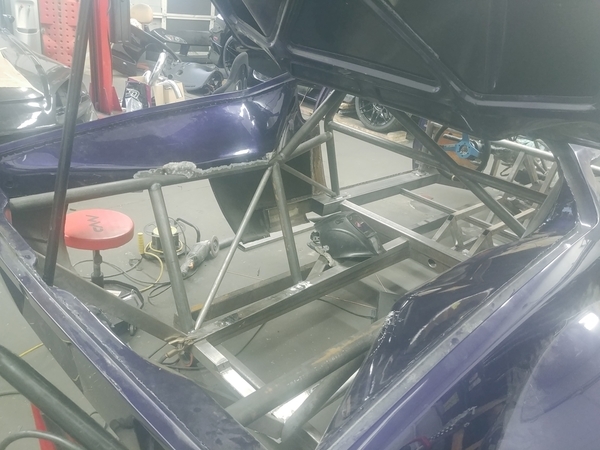 The current weight of the chassis with decklid and front differential is around 800lbs but still needs a bit more metal work and doors as well as hood. 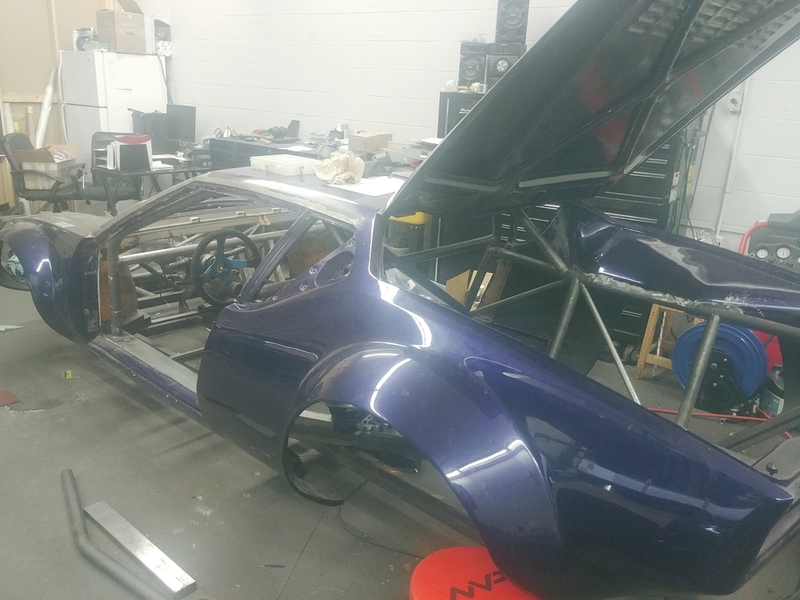 I am currently planning to reproduce the doors, hood, and decklid in carbon fiber to keep the weight down. Anyhow, enjoy the pics! Blaine, looks awesome! I’d hate to see your “to do” list! Did you ever find a shifter? If not, I see Superlite Cars are making their own shifter for the Graziano. Might be worth taking a look at. Amazing! This build would have made a great Velocity Channel show all on its own. Great work, greater patience! Good luck the rest of the way through. Thanks guys! Honestly, I will be happy when the structural fabrication is complete. It has been an interesting learning experience and there are always things that get done again when I am not happy with them. I had originally talked to the guys at Superlite Cars about a transmission adapter plate. I cant remember the gentleman's name I spoke to but he was a very nice guy. He did however express reluctance to sell parts to non-Superlite customers. I ended up needing something a bit different for an adapter plate so didn't end up going through them anyhow. Not sure how he would feel about selling a shifter to me, not to mention I am not ready to spend that kind of money yet. I have debated making my own shifter but going with a sequential unit instead. The box itself would still be a synchro box and would require clutching when shifting but would make it a bit easier to program in some options I am looking for. Blaine, you probably spoke to Fran at SLC. Superlite and Race-Car-Replicas customers are his priority but he'll sell stuff to anyone else as long as he isn't backed up (which he usually is). The only exception is Graziano transaxles. He cut a great deal with Graziano and now sells the six speed transaxles, brand new, for $10,000. The catch is, he's only allowed to sell them to Superlite kit owners and perhaps to other car builders. The reason for this is, Graziano doesn't want SLC interfering with their OEM (Audi and Lamborghini) business. Hey, is that an EPAS unit attached to your steering column? That name does sound familiar. He was super nice. Tried to talk me into selling my Pantera and buying one of his kits. I explained to him that I had this car since 1998 and that my father and I did a lot of the work together to get it back on the road the first time. It has a bit of a sentimental value. He understood and offered to sell me the adapter kit. That being said I would love to get my hands on one of his kits at some point! That is indeed and EPAS unit. Its out of a Prius. They have an external control module that will accept input from my ECU to give me speed based assist. This car will be a mish-mash of many manufacturers. Basically I am grabbing the some of the best parts/ideas from several manufacturers and combining them to make a rock solid track car that will see some street duty. So it'll be an All Wheel Drive Pantera?! That thing should be a monster on the track! Can't wait to see the finished product! Blaine, two suggestions for more loss of sleep: try the cable shifter developed by Lloyd Butfoy for his 6-speed ZF, and refined by the current rights owner (who's shop name escapes me right now but it's popular with GT-40 kit-guys and other mid-engine racers). A few are being successfully used in Panteras. Steve Wilkinson in So-Cal has a complete Pantera SI frame hanging on the wall of his shop, rescued from the debris of the old DeTomaso factory in Modena. He has photos. Thanks for the heads up Jack! I will have a look at the RBT shifter as well as get in touch with Steve. Lloyd Butfoy has not been involved with the Pantera Cable Shifter for a VERY LONG TIME. The current Pantera Cable Shifter looks nothing like the unit that started with Lloyd. It has been refined and improved many, many times over the years. This is an SACC Restorations product and has been for many years. SACC Restorations has made many improvements over the years. The geometry has been changed to improve the shifting experience. The units now comes completely anodized for lasting beauty at no extra charge. Once installed it never goes out of adjustment and requires zero maintenance. WAY MORE than a few are being successfully used on Pantera's around the world. I wouldn't be surprised if there are over 100 Pantera's that have this product installed if you go back to when the product was first introduced.